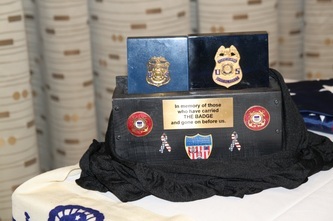 One of our annual Reunion/Conference activities is a memorial tribute dedicated to deceased Intelligence & Investigative Service Members. 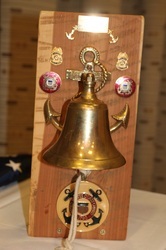 The ceremony will consist of a "Tolling of The Bell" and reading of the names added to the attached roster of "Crossed The Bar" Members for the previous year. The Coast Guard is the 'lesser known' among our Nation's Military Services and Law Enforcement Agencies and those who serve in the Intelligence & Investigative fields MUCH less known, except among "our own." Those of you reading this will personally know some, or many, former members of our unique and relatively small "Brotherhood Of The Badge." If after reviewing the list and you find a name missing please bring it to the attention of our Executive Secretary or Chaplain Bruce Sheils. Provided by Bruce Sheils. The bell tolled for those of us who have crossed the bar.